If you’re in the market for diamond wheels to meet your grinding and sharpening needs, trust the experts Eagle Superabrasives. Located in Hickory, NC, Eagle Superabrasives is a leading source of Superabrasive supplies in the United States. Ninety-percent of orders are on location and are ready for same-day shipping. We can even fill custom orders in as little as seven days. Don’t settle for subpar Superabrasives; contact the experts at Eagle Superabrasives for all your grinding needs. Diamond wheels provide an abrasive solution that allows for precise and clean cuts ensuring their superior ability for grinding and shaping difficult to grind (DTG) materials. An added advantage of using Diamond wheels over other conventional wheels such as those consisting of aluminum oxide and silicon carbide, is that diamond wheels are heavy duty and have a considerably longer life expectancy. The advantages of diamond wheels make them a valuable investment. However, there are many forms of diamond wheels available on the market today, so there are a few things to consider when finding the wheel that fits your business needs. Diamond wheels come in a variety of shapes, sizes, grit size, bonds and concentration combinations. 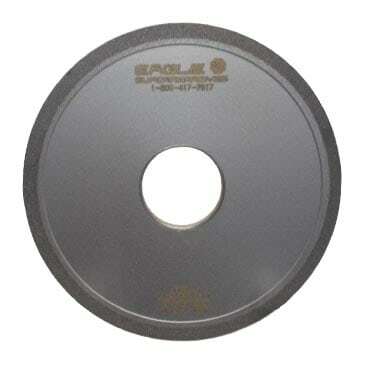 Eagle Superabrasives offers more than thirty basic diamond wheel shapes, guaranteed in stock. You can see the diamond wheel shapes we offer by clicking here. Grit size is a very important variation to consider when shopping for a diamond wheel, grit size will determine the cutting edge quality of your finished tool and will determine if you want an ultra fine cutting edge or a more utilitarian cutting edge. Eagle Superabrasives offers numerous grit sized diamond wheels from stock. Bond systems are extremely important because they are what retain the Diamond particle to the wheel. Our advanced bond systems and propriety formulations at Eagle Superabrasives will ensure that your diamond wheel products last longer while increasing your productivity and will ultimately save you time and money. Finally, concentration of the diamond in the wheel is also an important factor because it will dictate the workload of each individual diamond partical. A higher diamond concentration will prolong the life of your wheel, but may decrease your cutting speed. Inversely, a lower diamond concentration may decrease your diamond wheels life and increase your cutting speed. We know there is a lot to consider when deciding which diamond wheel is the best fit for your business needs. So whether or not you’re in the need of a diamond wheel or another superabrasive, trust the experts at Eagle Superabrasives. Our experienced staff will provide support and advice along the way. With unparalleled customer service, superior products and fast shipping, Eagle Superabrasives is an easy choice for all your grinding needs.Contact us today to place an order!